1. How has someone’s mentoring made a difference in your life or career? Mentoring was very crucial in my growth process and learning to adapt in my career path. I had the opportunity to work with an amazing mentor who helped me analyze my strengths and weaknesses and develop both in constructive ways, as well as making sure that I spend the time to feed my creative soul either at work or a lot of times outside of work. 2. What is your next big goal for yourself, personally or professionally? My immediate goal is finishing up my last exam, the CSE, and becoming a licensed architect in California before the end of this year. After that I want to focus on working on more interesting and complex projects and further developing my management and technical skills. My dream, long term goal, is to build a vibrant cultural community center one day. 3. In a parallel life, what would be your line of work? It would have to be something in the Performing Arts. Maybe a principal dancer, choreographer, or set designer. I've always been fascinated with movement and the articulation of the body to convey abstract ideas and emotions. 4. What has changed since you started in your field? The economic downturn was a big hit to our field. Personally, it had a big impact on the types of jobs that I got to work on. I was fortunate to work for most of it, though, and stuck through it until now where things have improved dramatically. In addition to that, I had my son in 2013 and embarked on a new journey of motherhood. That was also a struggle in a field that's not conducive to raising kids. I think we need to push our field to make some dramatic changes to be more accommodating to raising families. There is a good chance that we will be losing out on a lot of talent, which I already see happening. 5. Has your career path been shaped by being a woman? Absolutely. I've noticed that more clearly after having my son. I am not able to put in more hours like I used to prior to having him. In my previous job I cut down my hours to 4 days a week. This is not necessary a bad thing, but it does affect the type of work you do, along with reducing the level of involvement. I constantly struggle to find some sort of work/life balance since our line of work is very demanding. I do think that we need to have a dialogue about establishing more supportive work environments, whether we are single or parents. I truly believe that we do our best work if we are happy with our lives outside of work. That requires a cultural shift in our field as well as in the larger society. We have lost count of the number of retreats, but it has to be at least 30 by now. One day I'll have time to check all the papers I've saved from past retreats. This year was as enjoyable as ever: about 48 attendees, with the theme of "Navigating Life's Transitions: Tools for Change". Friday evening's show and tell session concentrated on changes that people had been through in the last year. Dr. Joan Steadman led the Saturday morning session, discussing how change happens, how we react, how we could be more mindful of changes as they happen. The session ended in a poetic way with people writing a word or two on what prevents them from dealing with change and dropping the slip of paper in water, where it dissolved to nothing. Dr. Steadman generously offered to talk to people individually about changes they are going through for the rest of the weekend. Thanks to Kris Raupach, Rachel Sloniki and Caroline SooHoo for coordinating this. The art project was making memory boxes and as usual, the group produced a dazzling variety of approaches. Allison Kinst did a wonderful job of providing materials and creating lovely examples of ways to create the boxes. Our first movement session was arranged by Helen Vasquez and I found it very interesting. Liv Schaffer, dancer and choreographer, led the group through a series of exercises. In one, a person made shapes with her body and the following person reacted by making a complementary or contrasting shape and the next person did the same and so on through the group. In another, the group traversed the room as if they were feathers, and then as if they were wading in peanut butter and then worked in pairs, with each person embodying a different feeling. The exercises were a real eye opener to me about how some modern choreography is created by narratives rather than by working with a vocabulary of traditional steps. The second movement session was led by a very warm and cheerful yoga instructor recruited by Shari Canepa. The band on Saturday evening was Foxes in the Hen House, an all-woman group playing American country and blues. As usual, the audience had great fun making up their own version of line dancing, swing and polkas. Thanks to Cammy White and Debbie Klein for finding the band. Many of the attendees walked the labyrinth at night and shared wishes for absent friends and thanks for good company. On Sunday morning, the Steering Committee took care of OWA+DP business matters and recruited new SC members. A final thank you was offered to the retreat committee, including Heather Sprague who handles the finances. Then there were a few more hours to enjoy the sun and the good company. Next year, Rachel Sloniki will take over most of the retreat planning; I will work with her on this and will help get people to the retreat. 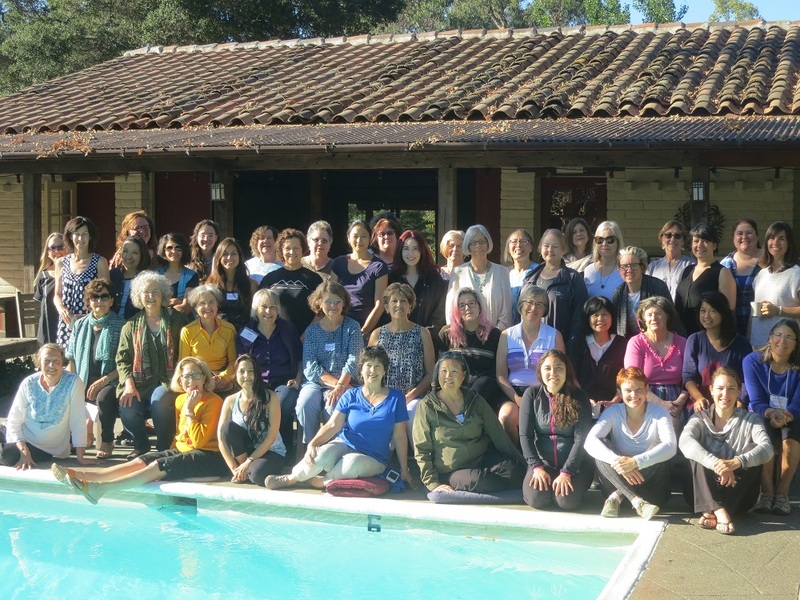 The dates for next year's retreat are September 29th, 30th and October 1st. To our dismay, this weekend conflicts with Yom Kippur, which we have always explicitly worked with Westerbeke to avoid. The dates were set 2 years ago and an error was made and Westerbeke can't change the dates at this point due to solid bookings for the whole month. Rachel, Christie Coffin and I looked into alternate sites for the 2016 retreat, but there was not time to research and make arrangements before the contract with Westerbeke had to be confirmed for next year. We have discussed this with the 4 people who observe Yom Kippur who were at the retreat on Sunday morning and they understand the situation. There are no conflicts for the dates in 2018 and 2019. 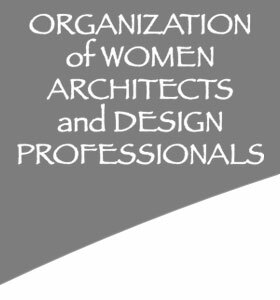 If you have taken a look at the OWA+DP calendar recently, you have seen that there is a series of lectures by prominent woman architects taking place at the Julia Morgan-designed Berkeley City Club. So far these have included Ellen Lou of SOM on September 22, Laura Hartman of Fernau & Hartman on October 13, and Marsha Maytum of Leddy Maytum Stacy Architects on October 27. If you have missed these lectures so far, there is still one more coming up. Allison Williams of AECOM will be speaking on November 9. Tickets are available here. The Steering Committee would like to thank everyone who attended this year's business meeting. The major topics of this year's meeting were electing new Steering Committee members, approving next year's budget, a proposal from Jean Nilsson for the OWA+DP 50th Anniversary Book, and reports from each Steering Committee member regarding their work for the organization this year. We are excited to welcome new members to the Steering Committee: Conyee Chan, Hannah Chatham, Spring Friedlander, and Helen Vasquez. Thank you to the following members who will be ending their Steering Committee terms this year. We are grateful for all the hard work they have put into the organization: Sharon Chio, Naomi Horowitz, and Gloria Kim. One fun thing that we incorporated into this year's meeting was asking attendees for feedback on what they would like to see in OWA+DP programs next year. Topics compiled from the retreat questionnaires were written on a white board, where each member could mark one item from each of the following categories: building tours, lecture topics, and skill development. Most interest was concentrated in women specific programs, like touring projects designed by/designed for women, and talking openly about your success as a woman in the profession. One of the major changes to the budget this year was increasing the amount for the scholarship category. We are hoping that committing more funds will help motivate an effort to organize a scholarship fund that will help more women through their architectural studies. This will align with our mission for the outreach and support of women in all phases of their professional lives. We are also allotting funds in our special projects category for the OWA+DP 50th Anniversary Book, which Jean Nilsson will begin to organize this year. We have also adjusted the budget to help aid our archivist Wendy Bertrand to digitize our past newsletters to upload to the website. I would like to share that BASE Landscape Architecture (my firm) has won a national award for the Roving Rangers, two bright and beautiful mobile park ranger stations currently serving communities in California. The American Society of Landscape Architects recognized our work on the Rangers with a 2016 Communications Honor Award, which honors achievements in communicating about landscapes and their value. Made from retrofitted bread trucks and resembling food trucks, the Rangers are a thrifty, flexible and non-traditional approach to bringing parks to people—and encouraging more people to come to parks. Also, I'm excited to announce that BASE is now officially registered as a Local Business Enterprise (LBE) and a Woman Owned Business (WOB)! 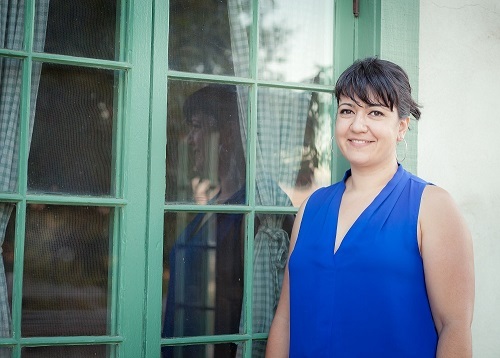 Rebecca just started her own firm, Synapse Design Studio. She has years of experience working on retail and commercial projects, as well as multi-family residential work. She's excited to be working on smaller retail and residential projects now. From build-outs and remodels to ground up construction, Rebecca enjoys working closely with the owners and end-users. Eliza Hart of Hart Wright Architects recently completed work on a project for the College Hill Reservoir site, a PUC owned, previously empty piece of land that has now been transformed into an outdoor classroom and environmental systems demonstration garden. 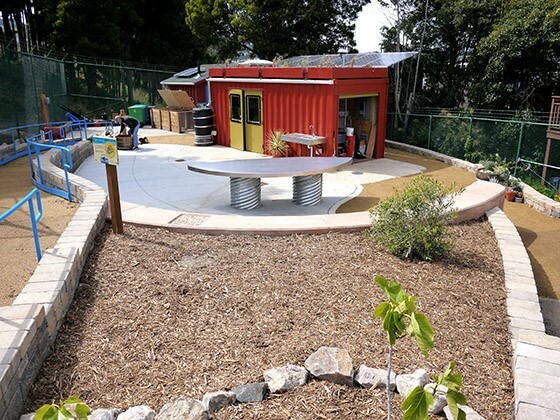 The PUC, working with the San Francisco Unified School District and Green Schoolyard Alliance, came up with the idea of a garden and outdoor classroom designed to serve students during school hours while also allowing nearby residents, not affiliated with the schools, to access the garden in the afternoons and on weekends. There are few school gardens in San Francisco that also provide gardening space for community members. We were grateful to be a part of a project that has such an innovative use of public land. 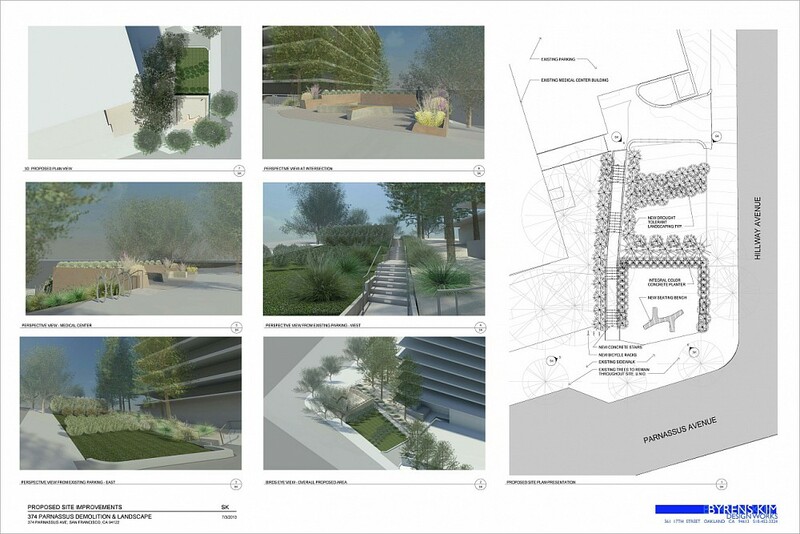 Hart Wright Architects, as part of a team, designed this site to serve both students and the general public, and we are excited to see a site and a design project dedicated to building awareness of environmental systems and environmental issues. The modified shipping container serves as an office and logistical staging area for the teachers. It's right beside the main central space, the outdoor classroom. On the roof are painted metal brackets that extend out to provide a structure for photovoltaic solar panels. The energy generated by these solar panels powers the container building lighting and the entire site. Inside the container building is a closet for batteries that store electricity generated by the panels, in what is known as an off-grid solar installation. To demonstrate a “green roof”, planters sit on the container building roof and are planted with butterfly attracting wildflowers. At the base of the container downspout is a rainwater storage barrel demonstrating rainwater harvesting. The onsite facility does not use any water. It is a an M54 Trailhead model by Clivus Multrum, also known as a waterless composting toilet. There are only two other facilities in San Francisco like this that do not use water. Waste is collected in a tank as compost. The gathering area uphill from the main classroom space is surrounded by garden with native plantings. The small elevated building in the background is a rabbit hutch. Additional features of the site include a small grey water collection trough, a pond planted with wetland plants, a rain garden, run off water storage tanks, swales, a rain water barrel, habitat gardens and observation areas. Various types of water pumps are sprinkled around the site. The College Hill environmental systems demonstration garden educates students and the public about Earth’s systems, biological cycles, and green design, and encourages a sensitivity towards the environment. This project shows a range of cutting-edge, site-specific, ecologically-based strategies known as “green infrastructure” on a micro-scale and provides a resource for students to learn about the ways that caring for our water, wastewater and power systems can help create healthy, vibrant communities. 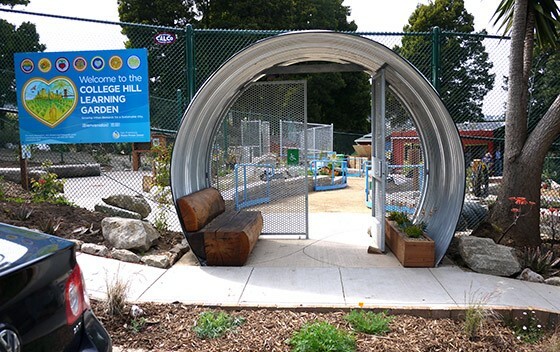 The various installations demonstrate San Francisco’s water, wastewater, renewable energy and energy efficiency systems. Programs will allow for hands on exposure to healthy food cultivation and sustainable living practices. We used a great big culvert to serve as the gate into the garden. The shipping container building and main gathering space and large table to be used for all kinds of programs. Note the solar panels, which allow the building to be off the grid. We hope you will get involved, come to events, and get to know your fellow members. We also thank everyone who has renewed their membership in the last two months.